Who knows if we'll ever live this close to Manhattan again! 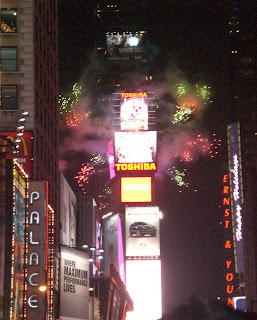 So, we decided that this would be the year we did the crazy Times Square for New Year's thing. We weren't able to convince anyone else to come (Andy was visiting the area from Cali, but decided to go to Hoboken instead), so we prepared as much as we knew how and went at it! We thoroughly perused the official website for tips. We looked up the weather. We asked the advice of friends. In the end, we layered it up, packed our pockets, and were off. We stopped for subs on our way to Trenton. We chose the more-expensive garage to park in because it had already been snowing a little and we didn't want to deal with brushing off the car and scraping ice at 3am. It was still only $13.50 to park for 13 hours, so not too bad. We ate half of our subs at Penn Station once we arrived, and were soon on our way to Times Square. We began walking a little after 4pm, and had a devil of a time trying to figure out how to get into the Square area. Police were of no help. The intersections the websites recommended were not correct. We stumbled upon a line two blocks long, full of people waiting to get searched so they could enter. I went on ahead, discovering that the line wasn't moving because it was a free-for-all at the actual entrance. I phoned Jonathan and he joined me as we shoved our way into the mob. We were searched three times each. Again, the police were not communicating with one another, as we were told to go to 47th, then 49th, then 57th, for no reason. We made it to our "pen" around 5pm... evidenced by the police repeating, "there's no rush. you're just going to be standing for seven hours." 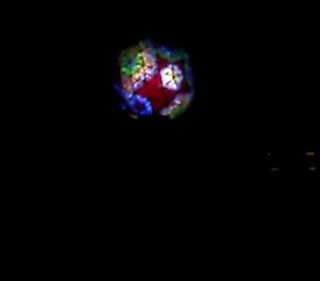 At 6pm they lit and raised the famous ball. It was also at this point that we began a 20-second countdown every hour, which became rather funny. I was afraid that I would get bored out of my mind, but it never got that bad. I didn't even have to coerce Jonathan into playing 20 Questions with me, haha! We could see the screens where bands were performing. They had speakers that were loud enough to hear most of the time. There were announcements and presentations every hour. Official New Year's people distributed freebies starting around 8pm. We each got hats, three-foot-long balloons with streamers on the ends, chapsticks in tiny coozies, lanyards, and coupons from Nivea. I think I was among the few who managed to safely bring a balloon home. People moved about somewhat... there was a group from Germany behind us for hours, but they disappeared at some point after 9pm. There were three funny guys in front of us for the first hour or so... they wanted to try and organize a giant game, haha. The girls to our left from 8-10 or so were from Merritt Island. 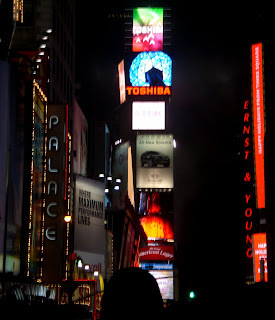 I talked to a guy our age from Atlanta for a while at one point... he had just moved to NYC a month ago, and was there alone that night. He had done film work, but was in the midst of deciding if he should return to school for computer programming. We didn't see much of him after it started raining the second time, though. It rained on and off for a few hours. Never very hard, but since it was below freezing, we were hoping for snow, instead. I tried tweeting pictures every hour, but there were some bad delays, and some never got posted at all. We only got one good photo of us the entire time. 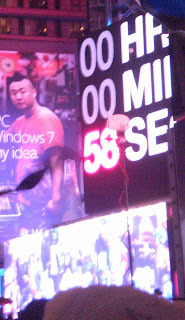 I also got a photos and videos of the "hourly countdowns," haha. The last two hours were the shortest, with the final hour almost flying by. This was unexpected, since the 9 o'clock hour crawled... we ate the rest of our subs, had some crackers and gummy bears, and took photos... all in the span of just 30 minutes, LoL. The last two hours had almost a constant video countdown on one of the screens we could see, which helped a lot, surprisingly. I got more and more excited as the time ticked down, and the pictures were snapped more frequently. 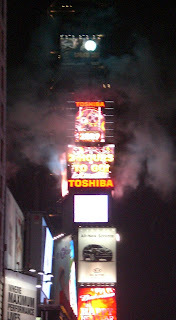 With the final minute, the ball began to drop... and it's SO MUCH MORE VISIBLE in real life than it is on television! It was crazy neat. I tried to get a decent video, but with so much movement in the throngs, it was a bit difficult. 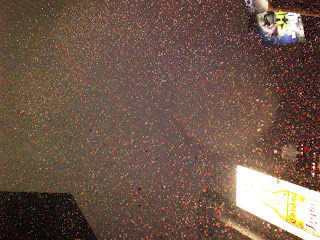 The confetti was really the most remarkable part, it just kept coming down! 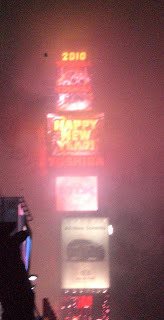 We were able to grab one piece for posterity, but it was difficult to get since the wind and rain were ridiculous! The fireworks and pyrotechnics ended up being a lot of smoke, which kinda sucked. At about 12:10, we began making our way back to Madison Square Garden, which took a while since the roads were still blocked in a bunch of places. We were able to get on the second train out, which I was impressed with... I figured they'd all be full for a while. All in all, we both thought it was a great time. It may be one of those things that you only do once in a lifetime, but it's absolutely worth it. 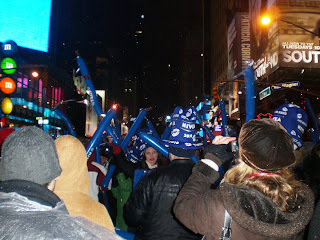 Freezing cold, rain, and standing for hours and hours is nothing when 11:59pm strikes and the excitement of the new year begins! What did you do about going to the bathroom!?!??! We went last year, but my fiance's uncle is a police LT so we didn't have to go til about 10:30 and he sneaked us in to one of the pens - I really wonder how people stand out there that long!!!! 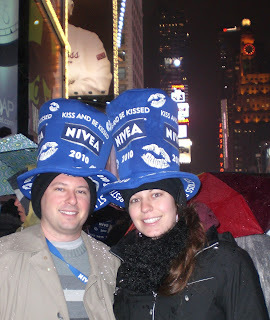 We did get the same hats and chapsticks though - what about the 3 musketeers?? We had bunches of those in the goody bags! It is definitely something everyone should do once, nice to see your take on it! we had read online that there would be no restroom possibilities so we hydrated before we got on the train, then hit up the restrooms at Penn Station, and rationed our water bottles for the rest of the night. We did see the police allow a few people in and out for that purpose, but others got out and were escorted away when they tried to re-enter the pen. We didn't have any 3 musketeers, but that would've been delicious, hehe! Regarding standing for that long, I wasn't actually that concerned. In college we had a yearly fundraiser called Dance Marathon - you have to stand for 32 hours straight... when you think about it that way, 7-8 hours is nothing, LoL! amy, this is really a great idea! it was fun to see how you two are doing so good. take care! tell jonathan i said hi!